Blog : Serving Up Success and Fun! 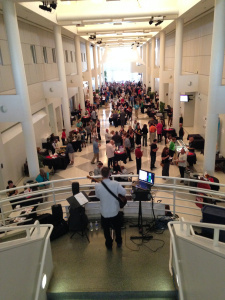 Thursday, September 25th the Independent Health Foundation held their 3rd annual Food and Wine Tasting Event, Serving up Success at the UB Center for the Arts. Serving up Success is a community event that brings some of the area's Healthy Options Restaurants, local breweries and wineries together for a night of good food and drinks for a great cause. With over 200 attendees this year, the Independent Health Foundation raised over $20,000 which will help fund their childhood obesity initiatives. At this event, the guests were able to taste wine, beer and over 30 Healthy Options samples of meals/desserts from our participating restaurants. The Independent Health Foundation had also received over 150 donated auction prizes with big items including a signed Buffalo Bills Jersey and an iPad mini giveaway. The event opened up with some acoustic music by Kevin McCarthy as guests walked around visiting vendor tables, the give and get table and participating in the silent auction. After talking with many of the restaurants, I gained a lot of insight on the special methods they take to ensure their meals are both healthy and tasty. I first talked to the representatives from Kabab and Curry. One way they make sure their meals are made healthy is by keeping their marinades lean and fresh with components such as ginger, garlic, lemon juice, and yogurt. They also stressed the importance of an abundance of vegetables within their entrees. I tried their ginger chicken kabab and vegetable biryani and was very pleased with the richness and flavor. Next, I talked to Joe's Deli and asked them what they do specifically to try and keep their meals lean. The representatives said they have adopted a few gluten free options for their customers, and they also make sure their meals don't have any heavy dressings. Some healthy menu items to try at Joe's Deli are the Thai Chicken Wrap, Build-a-Salad and Turkey Delight. Ultimately, the biggest surprise for me was The Como's stuffed Clams a la Como. Personally I don't particularly enjoy seafood, but they were very good, and it was definitely something I never thought I would be interested in trying. Keeping healthy meals in mind, The Como recently redid their menu offering many gluten-free or wheat pasta dishes for their guests. This event is a great opportunity to sample items that you typically wouldn't try at a restaurant in fear of not liking it or straying away from your usual entre. Another restaurant that has also adapted to the dietary restrictions of their guests is Curly's Grill and Banquet Center. The chef from Curly's was very passionate about serving his guests authentic food. He talked about how people have become more knowledgeable about food and it is essential to adapt to the wants and needs of your guests. The chef stressed the importance of making everyone feel comfortable at Curly's by offering healthy and tasty options to meet dietary needs such as vegans, gluten-free, etc. At Curly's they make their meals from scratch with fresh ingredients and all natural salts. After a night of sampling food and wine, the guests were able to vote on their favorite Healthy Options restaurant. I asked a lot of the guests which meals stood out to them, and heard many different favorites. From Joe's Deli's the Goat Cheese, Fig Sauce and Honey Crostini, to Firefly Cupcake's Gluten Free Pumpkin Cupcake, there was no doubt that all the food was something people were talking about. However, Rust Belt's Grilled Octopus Salad, Poached Pear Salad, and Veggie Lasagna Rollettes with Red Sauce came out on top as the favorite Healthy Options restaurant and winning $500! Overall, the event was a major success! The Independent Health Foundation would like to thank all the sponsors, donors and attendees. Without your support, the Foundation wouldn't be able to expand their community programs! Kelsey is an intern at the Independent Health Foundation. Currently, she is in her senior year of undergrad at Canisius College. She is studying Psychology and Communication Studies, with a concentration in advertising and public relations. She aspires to publish her work in two journals by the end of her spring semester. Although she's not positive what the future holds for her, she is passionate and invested in what she is learning within her field and through her internship experiences. In her spare time, she works as a dietary aide at a nursing home in Lancaster. She also likes to play soccer, be outdoors, and spend time with her family, significant other and friends.